LOS ANGELES, January 30, 2019 – The 70th annual Grand National Roadster Show in Pomona, held this past weekend, created a perfect charitable storm for non-profit Drive Toward a Cure, yielding fantastic fundraising success and capping off the organizations latest fundraising efforts, with a total of more than $70,000 raised for Parkinson’s Disease research and patient care. The weekend event was highlighted by the ‘Charity Pinstripers,’ who volunteered their artistic energy and talents to earn more than $45,000 in auction proceeds and donations. Entertainment at the show included a live performance by famed blues rock guitarist Jimmie Vaughan on stage before donating the instrument he had just played, earning $5,000 of that amount alone. Sean Kiernan, custodian of the original 1968 “Bullitt” Mustang from the Hollywood movie, had his iconic vehicle displayed throughout the weekend to raise additional funds and mark the conclusion of the “BULLITT 50” BRM Chronograph/Hunziker-designed art watch raffle, celebrating the car and film’s 50th anniversary. The raffle concluded on Sunday having reached 1,011 ticket entries and raising more than $25,000 in honor of Sean’s father, Robert E. Kiernan, Jr., with proceeds benefitting the Michael J. Fox Foundation from Drive Toward a Cure. The elder Kiernan, who purchased Bullitt in 1974, succumbed to his challenges of Parkinson’s in 2014. The charity raffle began October 17th, 2018 – on the 50th anniversary of the iconic thriller film and the winning ticket, which belonged to Dave Stone of Ketchum, Idaho, was announced on stage Sunday afternoon, prior to the shows’ award ceremony. Mike Brewer, host of globally renowned car show ‘Wheeler Dealers’ joined Sean Kiernan, automotive fine artist Nicolas Hunziker and Drive Toward a Cure founder, Deb Pollack for the announcement. Mr. Stone will be awarded the 1-of-1 BRM Chronograph watch, which includes both a hand-painted dial by Hunziker, depicting the legendary car AND a paint fragment from the original vehicle. The unique watch is valued at $35,000. 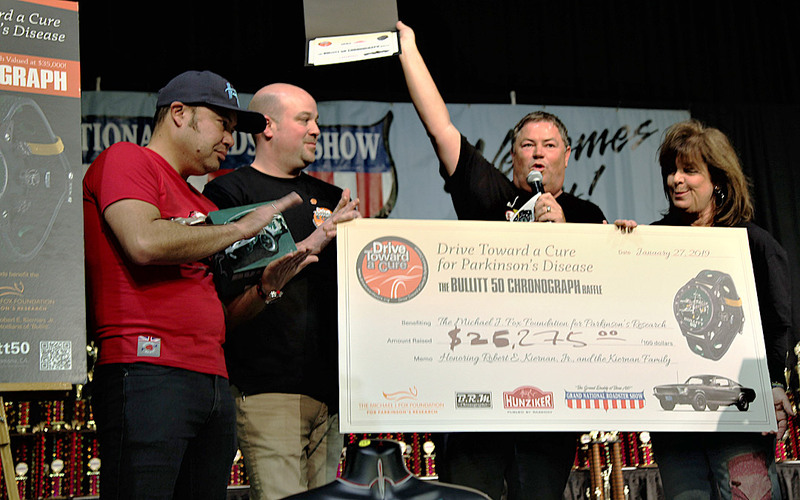 Those that contributed to the overall success of the charity weekend included John Buck, owner of Rod Shows and the Grand National Roadster Show, who had selected Drive Toward a Cure as the ‘charity of choice’ for 2019. He introduced the non-profit to Marshall Knapp, leader of the charity pinstripers – a talented, award-winning group of artists residing throughout the country, and volunteering their time and the fruits of their creative labor to raise funds through six separate auctions during the weekend show. While the Grand National Roadster Show became a forum to further the charity’s recognition, the Bullitt involvement began more than a year prior when Pollack met Kiernan at the Detroit Auto Show in 2018 for the debut of the original Bullitt car after nearly 50 years of obscurity. The iconic vehicle had been quietly tucked away at the Kiernan family farm in Tennessee. When Pollack, an automotive professional and enthusiast for several decades, had learned that she and Sean Kiernan had something more than cars in common – as each had lost a loving parent to Parkinson’s – a new friendship was found and a collaboration in cause had begun, leading to the celebratory watch and a means to raise funds and awareness for Parkinson’s. Thanks to the McQueen Estate and specifically Chad McQueen, Pollack was able to receive the stamp of approval to create a 1-of-1 artistic watch to honor the film, both men’s fathers, the car and Pollack’s mother all in one shot. Following consent from McQueen, Ford Motor Company and Warner Bros, Pollack teamed with French watchmaker BRM Chronographes and artist Hunziker (who already had the rights to Steve McQueen apparel and artistry) and created a very special iconic watch to be raffled on behalf of the charity. In the three-month cycle of ticket sales, more than 1,000 entries were purchased at $25 each, with sales to 12 countries and 32 states, building expanded awareness for the Parkinson’s cause. The Drive Toward a Cure program pursues an alternative to the numerous ‘for profit’ rally driving programs through the creation of events that team cars and camaraderie to raise funds in support of the challenges of Parkinson’s Disease, benefiting research and patient care. Drive Toward a Cure is a 501(c)(3) non-profit, with events that are carefully designed to provide a premium experience while raising much-needed funds to continue the search for a Parkinson’s cure, through beneficiaries The Michael J. Fox Foundation and The Parkinson’s Institute and Clinical Center. For donations, sponsorship and event registration, please visit www.drivetowardacure.org. Parkinson’s Disease (PD) is a chronic and progressive movement disorder, meaning that physical symptoms continue and worsen over time. Nearly one million people in the US are living with Parkinson’s disease. The cause is unknown, and although there is presently no cure, there are treatment options such as medication and surgery to manage its symptoms.